On the northernmost tip of Sumatra Island is Indonesia’s special territory, Nanggröe Aceh Darussalam, commonly known as Aceh. Thought to be the place where Islam was first established in Southeast Asia, Aceh today is home to a variety of ethnic and language groups. As Ache was once a rendezvous area for other nationalities, many Achenese are of Arab, Indian Portuguese and even Turkish descent. For some time, Meureuhom Daya region had a high number of light-complexioned, blond and blue-eyed locals. Aceh has a large population of Chinese locals as well, who play large roles in the financial and business communities. Aceh wanted political independence from Indonesia for a long time and because of the separatist rebel activities happening here, travel into Aceh was restricted. In 2004, Aceh suffered massive loss and destruction due to a tsunami that devastated much of its western region, including Banda Aceh, its capital. This catalyzed a peace agreement between Indonesia and the Free Aceh Movement, ending a 29-year battle for independence or autonomy. Aceh opened its doors to communities and donors came in to help the rehabilitation of the province. Today, peace reigns in Aceh as reconstruction and healing of the region gradually continues. While there continues to be some logistical difficulty getting into Aceh, once there, there is much to do and see. The most popular activity in Aceh is diving and snorkelling. Visitors reach Sabang and swim off its coast. Others prefer the calm beaches of Ujang Batee and Lampuk. The main cultural attraction in Banda Aceh is the Baiturrahman Great Mosque. 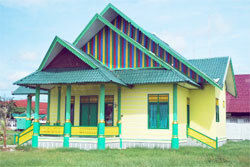 The mosque in particular is one of the most beautiful architectural attractions in Aceh. Built during the 12th century, its five onion-shaped, charcoal black domes sit on a lush green field surrounded by wide whitewashed walls and ornate pillars. The metropolitan city of Banda Aceh is Aceh’s capital. The name Banda originates from the word Bandar, which in Persian means “haven” or “port”. Banda Aceh, once named Kutaraja (“City of the King”), has beautiful architecture from different eras. It is just unfortunate that many tall buildings were destroyed by the catastrophic 2004 tsunami. The city’s most notable building is the domed mosque, Masjid Baiturrahman, one of the first of its kind in Southeast Asia. It was the Dutch colonizers’ idea of appeasing the Acehnese during the Aceh War, since they destroyed the city’s Grand Mosque. Masjid Baiturrahman copied Mughal architecture, and took two years to build. It was not as well-received then as it is now. Banda Aceh was slow to recover from the 2004 tsunami, and many places still remind one of the disaster. But the city stands courageously and attends to the present. North of the city are hotels and restaurants, while the south has residential neighbourhoods, called Geuceu Komplek. This area was unaffected by the tsunami, and some houses have become NGO offices. At the centre of town is the large bargain market Pasar Aceh Central, which has rows and rows of wet and dry goods stalls, and lots of cheap clothes. There are seamstress shops and shoe repair corners as well. There are some grocery stores around the area. Banda Aceh has beautiful beaches good for surfing: Lampuk, Longha, and Ujung Batee. The small inlets are used as fishing ports. Sabang, also known at Pulau Weh, is known to divers all over the world, as it is blessed with spectacular coral reefs covered in giant gorgonian fans and teeming with colourful marine life surround it and its smaller islands. The island is frequently visited by blacktip reef sharks, manta rays, ocean sunfish, and whale sharks. The most explored reefs are found in Rubiah. Sabang is the only town in the island where most of its population live. Here, one sees colonial villas amidst jungles and plantations. Sabang is best known for its beaches and diving. The most popular tourist activities are swimming, snorkelling, and diving. Iboih, where Gapang Beach is located, is geared to tourists, with pretty guest bungalows.